I was drawn to the name of this recipe, but when I initially read the ingredients I wondered what made it so special. It is the marinade. Do not ask questions. Just try it. You could add this to any savory meal for an extra serving of vegetables. The recipe suggests that you refrigerate the mixture for at least three hours before serving. However, the results are so good warm that we could not wait. My daughter is polishing off the serving you see in the photo as I type this (it is delicious with some tuna on the side). Apparently this relish was “all the rage” during the 1940s and I found the recipe in a cookbook called Lost Recipes by Marion Cunningham. She says, “This is a fresh relish and will keep no more than a day or two.” I am certain that won’t be a problem in our house. 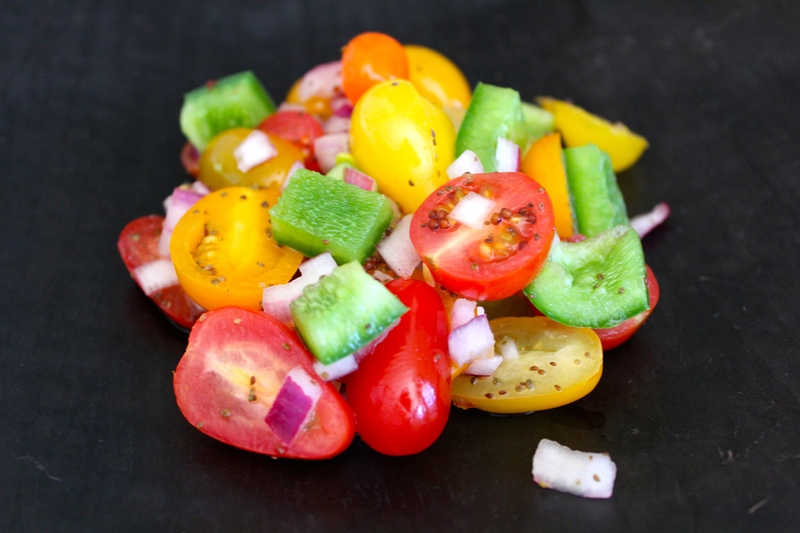 Combine the tomatoes, bell peppers, and onion in a bowl. Place the remaining ingredients in a pot on the stove. Bring to boil and cook for one minute. Remove from heat and pour immediately over the prepared vegetables. Let cool, cover, and refrigerate for at least three hours before serving (or eat immediately like we did). This is a fresh relish and will keep no more than a day or two. You can freeze leftovers. Note: I found this recipe in Marion Cunningham’s cookbook, Lost Recipes. On day 31 of this 365 day project, I ate my daily five (including some amazing accara – which are flavorful black eyed pea fritters – served with tomato jam from one of our favorite restaurants, Cafe Gibraltar). Did you enjoy yours?